Stone spa waterfall Travertine coping. Frontyard waterfall Landscaping and moss rock. Japanese inspired waterfall Pond with koi fish. Waterfall into pool Large waterfall flowing in pool. 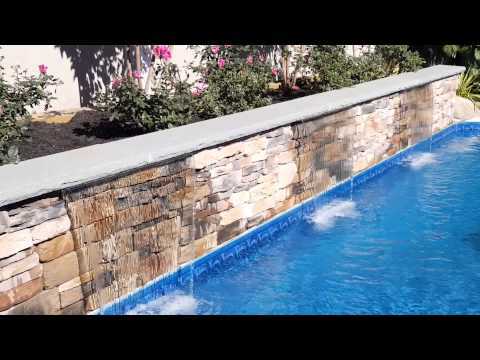 Sheer decent waterfall Stone wall with waterfall into pool. Long island Pond with waterfall. Koi pond with plantings. Backyard waterfall into pool rock waterfall. Pond less waterfall low maintenance Two waterfall spills. Zen led water fountain Led lighting. Hidden jacuzzi with plantings Colorful plantings. 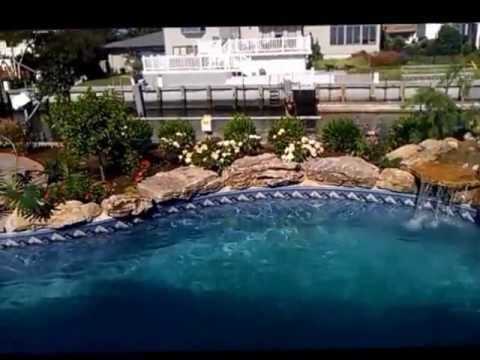 Waterfall from moss rock Landscaping and pavers around pool. One of the more popular ways to incorporate a waterfall into your landscape setting is by installing a waterfall by the pool. This positioning provides the homeowner with a set of landscape enhancing features: ability to landscape by the pool; enriched acoustics of streaming water; and melding aesthetically the pool with its surroundings. This addition to your landscape with its sense of serenity and nature will help transform your property into something more resembling a spa or vacation-like retreat. 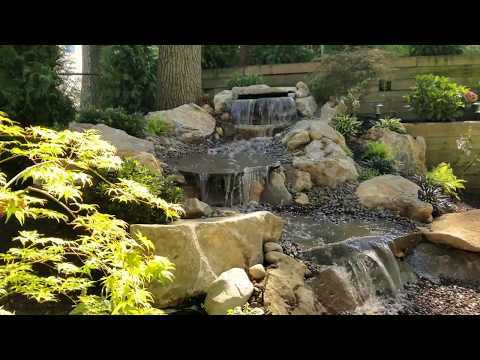 Another aspect of waterfalls is to utilize their beautifying properties to construct a pond and integrate the waterfall into your pondscape to provide sound and movement. There are many variables to consider for such a project: as to the size of the pond; determination of location so as to facilitate viewing from your house; sunlight exposure; access to water and electricity; and whether to introduce aquatic life. Contemporary pond designs are usually characterized by straight lines, right angles, simple materials and floating stepping stones. But garden ponds can vary incredibility due the desires of the homeowners and accompanying landscape setting. A font of options are available, but Design and Build will guide you through the process and advise with your input on the best course to achieve your desired result. Waterfalls without a pond are alluring because they provide a tranquil and relaxing atmosphere. The sight and sound of water in your own backyard provides a tremendous effect in naturalizing your landscaping. This type of project can definitely enliven your landscaping and enable other features such as lighting the waterfall to create dramatic effects, highlight fountains, sculptures and other special features of the waterfall.